There are certain types of food that I really wish I liked because when people eat them they look like they’re having such an amazing time. Oysters fall into this category. People who eat oysters look like they’re really enjoying themselves, but I can’t quite get past the fact that they’re alive when you eat them. I have this horrible vision of them sliding down my throat screaming in silent oyster agony as they plunge to their doom. Possibly I’m over empathizing with my food but nonetheless, absent being very polite, oysters aren’t something that I willingly eat. For years sushi was another thing that I wished I liked but that I had a hard time actually enjoying. Then I discovered the bastardized American version of sushi that involves vegetables and cooked shrimp and no raw fish. I reluctantly admit that the reason I have a hard time with sushi is because I’m squeamish about the raw fish. I feel bad about only liking the sanitized Western version of sushi, but not bad enough to eat raw fish. In fairness, I’m also squeamish about steak tartare and beef carpaccio. You cook that steak tartare and call it meatloaf and I’m a big fan, but raw it does nothing for me. 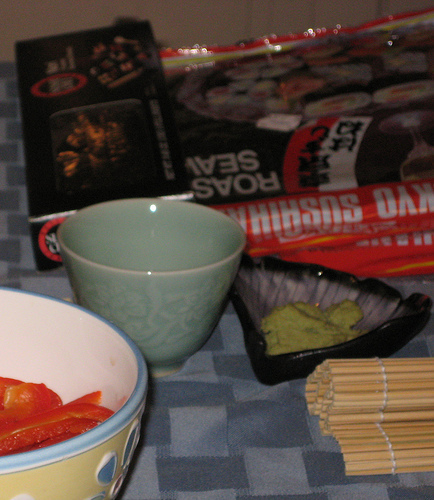 For my roommate’s birthday this year I gave her sushi accoutrements – a rolling mat, a cookbook, and serving plates. 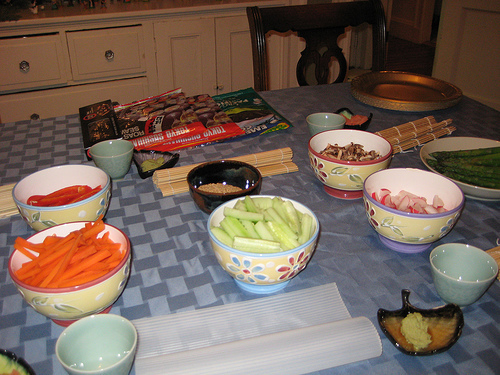 So for New Year’s this year we had a sushi making party. I provided rice and fillings and then left everyone to make their own meals. I also borrowed a deep fryer from friends who asked for and received one for their wedding, and we made tempura and fried wontons. After we’d all eaten enough to sink a small battleship we had the ritual New Year’s Eve playing of Trivial Pursuit. My father will be saddened to learn that I failed to remember that Fujimori was the former President of Peru, although since earlier this month I failed to remember that Kabul is the capital of Afghanistan possibly he’s already given up hope. When my mother and I play Trivial Pursuit my father sits in the background and makes appalled gasping noises when we miss questions (unless, of course, they’re sports or entertainment questions because he doesn’t know the answer to those either). When I play Trivial Pursuit with other people I frequently find myself channeling my father. Mostly this is because my concept of what should be considered common knowledge is slightly skewed. I can’t tell you what the guiding principal of cricket is, or the name of the Lone Ranger’s dog, but the idea that anyone doesn’t know the major players at the Conference at Yalta boggles my mind**. * I didn’t make the wontons, or even fry them, so I can’t provide a recipe, but I can say that they were awfully tasty. ** This example is not chosen at random. The question came up during a college game and nobody I was playing with knew the answer. I was aghast, loudly and at length. Nobody has let me forget it since, although I’m not entirely convinced that anyone actually remembers the answer to the question. Miso soup is ridiculously easy to make. It is notably also one of the only times I think that tofu is not only appropriate but appetizing. Miso soup is basically miso paste suspended in broth. For every cup of broth, use about 1 Tbsp of miso paste. Recipes for Miso soup generally call for making a fish broth by dissolving bonito flakes in water. If you don’t like fish broth, can’t find bonito flakes, or are serving people who are allergic to fish, substitute vegetable or chicken stock. I used vegetable stock for all of the above reasons (well, I probably could have found bonito flakes). Bring broth to a boil, and then reduce to a simmer. Add miso, and whisk to combine. Once you’ve added the miso do not allow the soup to boil again. Cube silken tofu into 1/4” dice. Add to soup. Slice some green onion and add to soup. 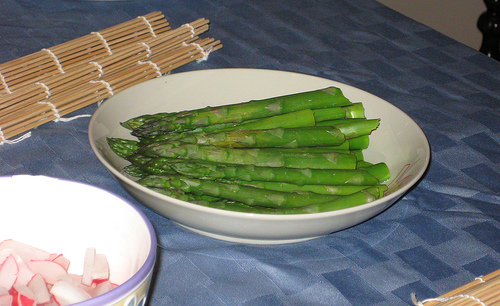 You can also add some rice wine vinegar if that floats your boat, or some shaved fresh ginger. Sushi is time consuming to set up because it involves a lot of chopping, but once you’ve done it it’s easy to set out and then stand back and let everyone make their own dinner. To make sushi you need a medium or small grain rice, a long grain Western rice won’t give you the right kind of sticky consistency. We happen to have a Japanese grocery store fairly near by, but a large chain grocery store will probably have sushi rice available. You need less water to cook a short grain rice than you do for a long grain rice, so use 1.5 cups of water for every 1 cup of rice. Rinse the rice 2-3 times, until the water runs clear. Then add the rice to the water in the pot and bring to a boil. Once the water has come to a boil, turn down to a low simmer and cover. Cook for 20 minutes, then turn off the heat and allow to stand for 10 minutes (or follow the instructions that come on your bag of rice). Turn the rice out into a wide bowl, add rice wine vinegar and toss lightly until it is all absorbed. Then allow the rice to cool to room temperature before using. Heat the vinegar to dissolve the sugar and salt, and then pour over the cooked rice and gently toss to combine until all the liquid is absorbed. There were nine people making sushi and I made 4.5 cups of (uncooked) rice which seemed to be about the right amount. Given that I’m not a huge fan of raw fish, nor is anyone who was coming to the party, I skipped the effort of trying to find a source of really high quality fish. I bought some cooked shrimp, and a little salmon that I cooked and flaked for anyone who wanted to make California rolls, but other than that the sushi offerings were all vegetarian. At the last minute I julienned some cucumbers (seeds removed) and avocados (sprinkled with a little lemon juice to make them last a little longer). There are of course endless variations on sushi, and I don’t know the names of all of them. We did a very basic and standard looking sushi roll of rice wrapped in a sheet of dried/roasted seaweed (nori). To make sushi you spread a little rice on a sheet of nori, and then add the filling of your choice. Roll up tightly, and seal the nori with a little water. Slice and then share the wealth. I also made tempura, although I cheated and used a box of tempura mix that just required that I add water. I had a deep fryer at my disposal for my tempura, but if you didn’t happen to have a nuptial deep fryer handy you can do tempura in a deep frying pan. I did tempura with sweet potato, butternut squash, broccoli, asparagus, zucchini and chicken. The vegetable cooked in about 3 minutes, while the chicken took about 5 minutes (cut into more or less bit size pieces). Sushi made with sweet potato tempura is excellent. It’s starch fried in starch, wrapped in starch and it’s hard to go wrong with that combination. My roommate attempted a Japanese dumpling dessert, which ended up better in theory than in practice. Or possibly we are just too hopelessly Western to appreciate the results. In theory, I think the dumplings are supposed to be a little like bao, but in practice they were very heavy and gluey. 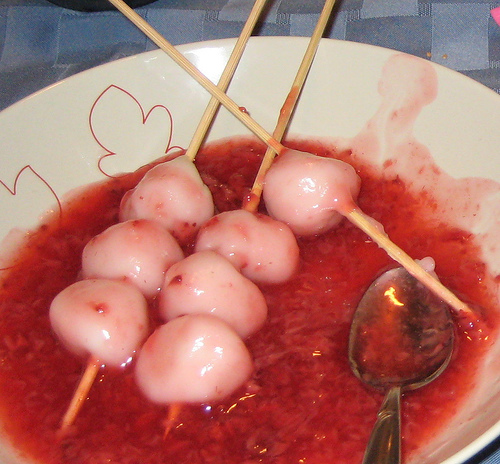 The fruit sauce that went with them was yummy, but in the end we all decided they looked better than they tasted, so in that vein here’s a picture of them in lieu of a recipe. Flattered to be mentioned in dispatches!